Eminent filmmaker Karan Johar is going gaga over the SS Rajamouli's BAAHUBALI, the epic war drama that is touted as the costliest film of the country. Praising SS Rajamouli to dizzy heights, Karan Johar candidly confessed that Rajamouli’s genius can be gauged form the fact that till date he has made nine movies and all have hit bull’s eye. “I candidly admit I do not possess the skills of Rajamouliji nor do I think most of our Bollywood counterparts are competent. I hope after watching this film our Bollywood filmmaker take a lesson and try something novel and out of the box films like Rajamouliji,” frankly confessed the filmmaker. 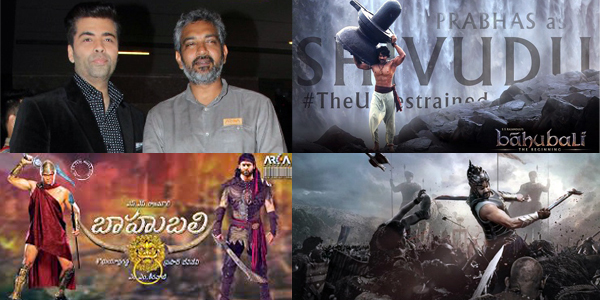 Acclaimed for his stupendous works, National Award winners, S. S. Rajamouli has left no stone unturned to make the movie at par with Hollywood magnum opus like TEN COMMANDMENTS, BEN HUR, GLADIATOR etc. According to sources BAHUBALI is being planned with an estimated budget of Rs 160 crore of which Rs 85 crores is invested in the special effects, alone. The filmmaker has hired 600 artists from all around world who are working with the most advance and complex CGI and VFX technology. The movie has generated the same kind of hysteria among the film buffs as Bollywood movies like MUGHAL E AZAM, PAKEEZAH, SHOLAY etc had generated prior to their release. It may be noted that BAHUBALI, is one of the few films that has been mentioned in BBC’s documentary - 100 Years of Indian Cinema (2013)!